“If you are planning to stay in touch with uncle Gerald in Rotterdam or cousin Rachel in New York this Christmas, then we’d like to hear from you! The winners will be selected randomly by a computer programme, and the lucky ones will be awarded with a Skype Gift Pack.” Also you can Record Skype video calls with SuperTinTin. In your Contact list, find the person you want to talk to. In the main window, click the green Video call button. In the same way, You can Record Skype video calls with SuperTinTin. There are some amazing new features in Skype 5.0 for Windows. Group video calling – make a video call to up to nine contacts at the same time. Find friends and add contacts quickly and more easily. Instant messages delivered even when sender and receiver are not online at the same time. Automatic call recovery – automatically reconnect Skype calls that are interrupted due to network problems. Skype Home – follow your friends’ mood message updates, view information about your purchases, set your profile picture and mood message, and learn more about using Skype. Improvements to the way Skype looks – clearer, better and simpler to use. You can download this release of Skype for Windows from the Download area of the Skype website. Also you can use Skype Recorder with this new Skype update. The new features in Skype 5.0 Beta for Mac are designed to make your life simpler, and to make it even easier to do more together – even when you’re apart. New look Full screen window, with the sidebar containing Contacts, Favorites and Recent conversations. Group video calling (beta) Make a group video call with your friends or colleagues. Offline instant messaging Send messages to a contact, even if they’re offline. They’ll receive them the next time they sign in. Full text searching Search contacts and conversations for a word or phrase. Favorites Add people you frequently contact, and important conversations to your Favorites list so you can find them faster. Call control bar The new mini call bar allows you to hang up, mute, and manage calls without having to switch back to Skype. Add phone numbers to contacts Show a contact’s profile and add their mobile, home or work phone number. Contacts Monitor Access your online contacts quickly with a mini Contact list that sits on top of any web pages or documents you’ve got open. Avatar flow Flick through your contacts’ profile pictures instead of viewing them as a list. Question 1: How do i stop freezing with skype video chat? My skype video chat keeps freezing. What do i do? Answer: Check your PC speed, RAM, and Internet speed. Try to free up as much Ram as possible before chatting. Close any programs you are not using before starting Skype. Question 2: Why does a giant cat show up in my skype video window? Almost every time i video chat on skype with my friend, where her face normally appears, a giant cat shows up with moving eyes and mouth… Virus? Answer: She is using a software which allows you to put masks on, when in webcam. Question 3: Which mobile phones have the ability to make Skype video calls? I just want a straight answer to the above question. Ideally a list of the brands and models capable of making video calls via Skype. Answer: For now, Skype video calling is only available on a computer. It cannot be done on any mobile phone. But it is said Skype will bring video call to iphone4 very soon. Most likely at CES 2011. Question 4:Do both people in two different countries need to buy a Skype Subscription in order to video chat w/each other? I’m leaving for the Philippines in December and I want to be able to contact my family in the US through Skype Video Calls. Am I the only one who needs to buy a $12.95 subscription or do they need to buy one as well? Answer: Skype video call is free. Question 5: Is there a way to view old skype video calls? Is there any way to recover and view past video calls on skype? I guess not but just wondering. Answer: You would need to record them with a Skype video recorder like Supertintin(windows) or Ecamm(Mac0, and then play them back. Question 6: How do you take a Skype video snapshot that shows both caller screens? A: Windows: Press PrtSc to copy a full screen picture. And open Paint, Press Shift+Insert to paste the picture. Mac: Press Command shift 3 to take a full screen picture. It will show as a picture file or PDF file immediately on the desktop. Question 7: My Skype video calls are pretty choppy and it really gets annoying. I usually chat with someone who has a very fast connection. Any tips to improve its performance? Your internet connection might be the issue OR your CPU speed. Check your PC speed.. right click on My Computer – Properties. There should be a number ending with GHz. followed by RAM. If GHz is lower than 1.5GHz then that might be the problem. If RAM is lower than 512MB then that’s another problem. Try closing any extra programs when you’re on skype. Question 8:Will the date taken of a Skype Video snapshot appear on a foto that I imported into my pics? were imported or the date the snapshots were taken. Answer: As always, under Windows, the date shown is the date it was taken, in the Details View. The only exception to this is when you make a copy to a USB Flash Drive, for example, which sometimes shows the date the file was copied, in the Details View. But, right-click and view Properties to see when the original photo was taken. Question 9:How can I record a Skype Video Chat so I can put it into a movie? I am helping my football coach with our school’s football recruiting video. One of our players last year is in Florida with the Gators, he can’t come up for an interview, so we were going to Skype of iChat him and ask the questions. If there is a free and program that I can download that will get me good quality video and/or sound? Even if its recording everything that is on the screen that is fine. Answer: Ecamm is your best choice since you are on MAC. We recommend Supertintin on Windows. Many people use camstudio also which is a general purpose screen recorder. Ecammm and Supertintin are designed for online video recording only. Question 10:How can I get my Acer Cyrstal Eye Webcam to work with Skype video on my Acer ApireOne Netbook? I recently downloaded Skype, and for some reason, when I go to video call someone, I can see them but it says there was an unknown error on the video on my end. Answer: Open Skype, Tools->Options->Video Setting, and check your webcam. Question 11:How can I download my SKYPE video conversations with sound? I tried to down load my SKYPE conversations with my family abroad while they were chatting with me using video communication but failed.Please let me know how to do it.Thanks. Answer: Try Supertintin (Wondows) or Ecamm (Mac). Question 12:What options for recording of video conversations using SKYPE and MSN messenger.I already have both programmes but do not know how to record video conversations while I am talking to my family in a foreign country.Can anybody help me?Thanks. Contact list Added an option to disable avatar pictures in contact list. P.S : SuperTinTin Skype Recorder will continue working with Skype new version. Do you know there is a special Chinese version of Skype? Skype and its Chinese partner, Tom online, work together and provide a special version of Skype which can block all the words in the black list. Chinese officials have been monitoring in and out messages running through over the years for the sake of their censorship law. Combined with the May addition of support for Skype calls over AT&T’s 3G data network — and Skype’s simultaneous decision to keep 3G calls free indefinitely — the app is now a workable replacement for the iPhone’s normal calling feature, especially for those people who have Skype accounts which provide real telephone numbers. Video calling is not included — “yet,” we hope, since the iPhone 4 is the first model to have a front-facing camera. But that feature may have a hard time passing Apple muster since it duplicates a new core functionality, FaceTime. Still, this is what we’ve been talking about when we spoke of mobile VoIP nirvana, and it puts the iPhone in the forefront of Skype handsets (in the United States, anyway). Skype mobile is available on a handful of Android and Blackberry phones with Verizon, but only for Skype-to-Skype and international calls — not to “online” numbers or regular phones. Credit for freeing Skype on the iPhone should not go to Apple or Skype, but, ironically, AT&T. When the exclusive carrier of the iPhone started limiting the amount of data users can upload and download over their phones’ wireless data connections to either 200 MB or 2 GB per month, it paved the way for “unlimited” Skype months before the multitasking iPhone that could truly support it was released. Skype video call recorder SuperTinTin is here. Joel wrote a blog about how he record his weekly Stack Overflow podcast. Skype is probably the most widely used Internet Phone service for conducting telephonic interviews, panel discussions, conference calls, recording podcasts or plain voice chatting. To date over 190 million people have downloaded the Skype program. Though Skype doesn’t provide native support for recording voice conversations yet, you can easily record Skype Call Sessions using third-party add-ons or hardware devices or even with software that already exists on your computer. 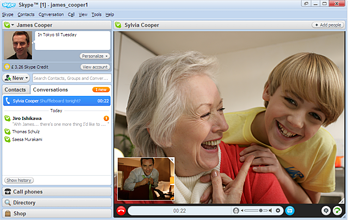 The Skype Phone calls are recorded to regular audio files like MP3, WAV or Windows Media which can edited and shared with friends like regular media files. Let’s look at some of the more popular Skype add-ons and resources here for recording Skype Calls. If you are a Mac User, Audio Hijack or WireTrap Pro are probably the best options to record Skype Calls or Skypecast. » Let the other parties know that you are recording them and obtain their permission to record. This is a law in some states. » Skype will save the voicemail locally after you’ve played it but it uses some odd format. To convert the skype dat sound file to MP3 or WAV, use HotRecorder mentioned above. » Doug Kaye has a nice illustration of DIY skype recorder without an external mixer. » If you plan to use the SkypeCaster method, this Skype discussion thread will be prove useful. » Few other nice things you can do with Skype. » Before placing Skype call or recording conversations, it’s always nice to test your Skype Sound Setup. This article summarized 10 Skype Alternatives. SightSpeed – Mac and Windows app offering unlimited free PC – PC VoIP calls, unlimited free PC – PC video calls. Reduced rates for PC – landline / cell phone calls. Also features video blogging capabilities. Google Talk – A soft VoIP application for Windows that offers VoIP and instant messaging. Mac users can talk with Google Talk users using Jabber-enabled clients such as Adium and iChat. Linux users can use Gaim. Gizmo Project – SIP based P2P client in the same ilk as Skype with integrated call recording. At the time of writing, Skype currently requires extra software to record calls. iChat – Mac OS X application that offers PC – PC calls between iChat and AIM users. VoIP Buster – Windows app offering free PC – PC calls and 120 days of free calls to landlines. Jajah – Web-based VoIP interface where you enter your phone number and the number of who you want to dial. Jajah calls the caller and the person you are calling. You both answer, the calls begins and you can talk. Does not require any new software or hardware. Amicima – Publishers of a soft VoIP application called amiciPhone that offers a combination of user presence, file transfers, photo sharing and instant messaging. ComBOTS – German app that offers free VoIP calls, photo sharing and drag-and-drop file sharing for files up to 200MB. OpenWengo – Open Source app based on the SIP protocol for free VoIP calls between 2 PCs with SIP-compliant software. You can hook into any other VoIP provider that uses SIP. Also offers SMS, video chat and instant messaging. Vbuzzer – Soft VoIP Windows app offer free calls between Vbuzzer users and reduced call rates to landlines. Also offers instant messaging.